Should we read the Kay Hooper books in order? The Kay Hooper books in order include all the books in the Bishop Special Crimes Unit paranormal mystery series, as well as the books in the author’s Bishop Files and the Quinn/Thief series. While Kay Hooper also wrote several standalone novels, those can be read in any order you choose. So here are all the Kay Hooper books in chronological and reading order based on the year of publication for all her series and standalone romantic suspense novels. I will only list here Kay Hooper’s mystery (series in and standalone) novels, as her romance novels are beyond the scope of this site. When listing the books, I will add next to each book in brackets the trilogy it is belonging to, however, do bear in mind that all books in these mini trilogies are part of the Bishop series. The team (fully or partially) is present to solve the cases in each book. Kay Hooper was born in 1958 in California. Her father was stationed at an air force base, so Kay was born in the air force base hospital. Soon after, the family moved back to North Carolina, which is where she grew up and went to school. Kay is the oldest of three children. After graduating from East Rutherford High School, she enrolled at the Isothermal Community College for business classes. Soon she realized that business was not for her, so she switched her major to history and literature. Along the way, she also started writing, something that Kay was interested in for a very long time. She was always a voracious reader, long way before the started writing, so putting words on paper seemed natural to her. 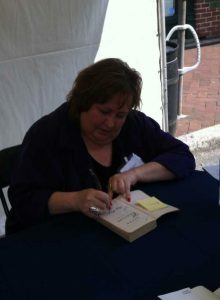 She started writing romance novels, and over the years, she transitioned to mystery, suspense and even thriller novels. Kay Hooper wrote her debut novel, Lady Thief, on a typewriter. The book sold to Dell Publishing in 1980. Over the years, the author Kay Hooper has written over 60 novels, most of them in the romantic suspense genre. Currently, Kay is living in a small town in North Carolina, not far away from her siblings and her father. Ever since I’ve read the first book in the series, Stealing Shadows, I was hooked. Granted, I read this book at a time in my life where paranormal mysteries held a very special place in my heart. Ever since then, however, I grabbed the next book written by her as soon as it came out. In an interview, Kay Hooper mentioned that part of the reason why she started writing a mystery series involving paranormal investigators is that she herself is interested in the paranormal. She believes that psychic investigators are real and that there is a scientific basis for their extrasensory abilities. Kay Hooper has also written another mystery series called Quinn/Thief, consisting of 2 books, which I’ve read as well. In fact, I can safely say I’ve read every mystery novel by this author, with the exception of her earlier romance novels, which are, anyway, not in the scope of this site. Some people might say that author Kay Hooper has written several series in fact, such as the Evil trilogy, the Shadows trilogy, the Fear trilogy, the Blood trilogy, etc, however, these are subplots of the main Bishop series and I consider them part of it. Kay Hooper’s latest novel Wait For Dark, part of the Bishop SCU series, is available from March 2017. In this book, the SCU team has to go to a small town called Clarity in North Carolina to investigate some strange accidents. When they get there and start looking into this, it appears that the accidents might not be accidents at all. Having read all the mystery novels by Kay Hooper, I am strongly leaning towards saying ‘yes’, we should read the Kay Hooper books in proper chronological order. All the Bishop novels include various characters from the team and each book – or at least each mini trilogy focuses on a person or a set of characters, expanding them, letting us know them really well. So even if you don’t read every single book in order, I suggest at least reading the various books in the mini-trilogies in order. So, for example, if you happen to pick up a book from the Blood trilogy, try to read the first Blood book, with the title Blood Dreams, first. Or if you get hold of a book in the Haven trilogy, make sure you first read Haven, then Hostage, and then Haunted. You’ll thank me for it. Do note that for the Bishop series, except the first Shadows trilogy, which is only available in the various paperback and hardcover editions, all other books in the series are available for the Kindle (at the time of writing this post). The Quinn/Thief series includes only 2 books, so it won’t be difficult to grab them in order. Absolutely love the bishop series. Keep them coming. Hurry up April 3rd!!! Is there other books she writes that are like this series? Kay Hooper knows how to create a great story line and build suspense until the very end of the book. L O V E her books!!! I’ve been waiting for 13 years nw to learn if Quinn (Alex Bannister) ever catches the female thief of the Talisman emerald. How did she manage to not only steal it BUT manage to replace the setting with near perfect fake? Will this author ever complete the series? Due to the fact that the “Quinn” books were the first books I’d ever read written by this author and the fact she never completed that series but DID leave us hanging I’ve never had the urge to purchase another of her books. I honestly have no idea if she writes her other books as she did the 2 in the Thief series and by golly I’m not about to ever take a chance on being left hanging again. I did enjoy the 2 Thief books however I’m very sorry I ever bought the first one in 2002 then had to wait a year for what I thought would be the conclusion, the series is still not concluded! I’m not sure but I feel like a deadly web and the prophet didn’t end there. Shouldn’t there be another book in this series or am I missing something? Sadly indeed there are only two books in the Bishop Files. I wish there were more. I love it, read it a while ago, will review here shortly. I love it, very good book. Read it recently, will review it here shortly. These are the best written books , I love all them , have been reading them for years , I am a bit behind now that I’ve retired ,I can’t afford the cost, so need to space out purchasing non essential needs , and really have had little time to sit and read , now isn’t that funny . So Haunted is my next read , maybe get it for Chrisrmas . I so love Hollis , she is my favorite in the series , and her partner/ mate is so perfect for her . So on to Haunted when I get a chance ! I love Kay Hooper also. Let me know which of her books you have not read and I may be able to get them to you. Give me your contact information so I can get in touch with you. I too am retired and thoroughly understand budget issues! I find most of my books in thrift stores or yard sales. Really helps out when you have to watch your money. When someone asks about birthday or Christmas gifts I always have a just released list handy. I gave read all most all of the Bishop serious and found 4 that I haven’t read but will be doeing so this winter. Also want to get The first prophet and a deadly web to read. Love her books!!! I’ve read all the books, I loved the characters, the plots and there extra senses. I can’t wait for the next series. These books sound interesting but being as it is about murder I just want to know if it involves any animal murderd/cruelty before I decide to buy one. I’ve read every book in the series and I don’t remember to be anything in it about animal cruelty. If you are worried about details of animal murder or cruelty, then the short answer is no. The only two things I remember being mentioned is that serial killers start young by hurting or killing animals, bed wetting, starting fires, and then later in the series reading order it mentions a mass killing of all animals in a compound by a psychic. No details though thank goodness.